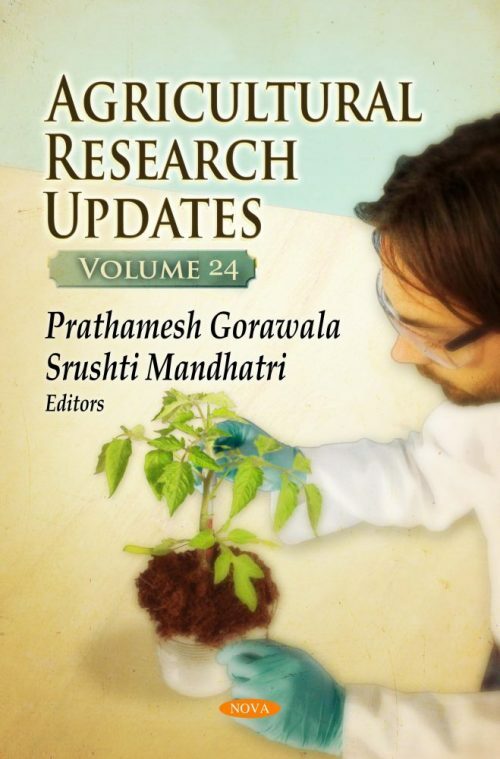 Agricultural Research Updates. Volume 24 begins with a mention of various features of maize chromosomes such as cytological mapping of meiotic chromosomes, heterochromatic knobs, centromeres, neocentromeres and DNA content in the maize genome. The authors report on the variability of tropical maize chromosomes and on chromosomal alterations in maize karyotype that occurred in callus cultures. Next, the authors present an overview of reports addressing the successful development of rhizobial strains that are symbiotically more efficient by overexpression of single or multiple genes, directly or indirectly associated to the symbiotic process, such as nodulation, nitrogen fixation, stress response and phytohormone production genes among others. The main objective of the following chapter is to evaluate the performance of 42 olive varieties in low water conditions and to infer the relationships between leaf parameters and other variables. The findings of this study provide supplementary information about the performance of olive varieties cultivated intensively under low water conditions and what leaf indices can be used to evaluate their responses. A chained set of trials was conducted and described with the aim of studying whether corn fertilized by Arbuscular Mycorrhiza could influence crop yields, affect mycotoxins and modify poultry and pig meat production, in the short term, or after a long period of storage. Two experiments conducted in corn fields treated with a commercial bio-fertilizer have shown that the yield can be improved and that the resistance to fungal attacks had significantly increased. Additionally, the authors aim to develop and evaluate the cosmetic performance of emulsions containing oils and vegetable butter from Brazilian organic agriculture, verifying the influence of these emollients on the physical-chemical and sensory stability of cosmetic formulations. This is the first study investigating these raw materials from Brazilian organic agriculture in emulgel-type cosmetic formulations. The next chapter describes a new no-contact method of determining bird mass that does not have the deficiencies of old-fashioned automatic weighing platforms in the poultry industry. The method is based on computer processing of digital top-down images of the birds automatically taken with a camera mounted on the ceiling of a poultry house. Salacca edulis is known to possess flavonoids, flavanol, tannin, anthocyanin, ascorbic acid, alkaloid and antioxidants which may make it important in disease prevention. The authors aim to assess the long-term impact of S. edulis intake on specific populations and their functionality claims. In the closing study, four native Bradyrhizobium isolates (NRI1, NRI2, NRI3, and NRI4) obtained from field trap cultures set in acidic soils of Kenya and a commercial inoculant (USDA 110) were examined for acid tolerance on yeast extract mannitol agar at pH levels of 3, 5, 7 and 9.